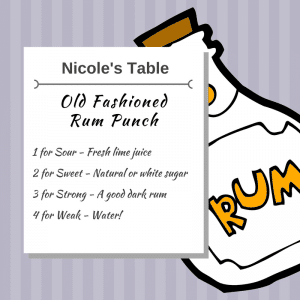 This Old Fashioned Rum Punch recipe is perfect in its simplicity. My grandmother uses this recipe. Each island having its own variations. Some ways to spruce up the punch can be found by adding freshly ground nutmeg and/or bitters. Garnish with slice of lime and serve. Select the measurement that you are going to use. We use cups here. If you use cups, then get a large pitcher pour and mix accordingly. Add ice to your glass, add the punch and a garnish (if you wish), and serve. Please let us know how you like my Old Fashioned Rum Punch recipe via our Contact Us page, our Facebook Page, or Instagram.